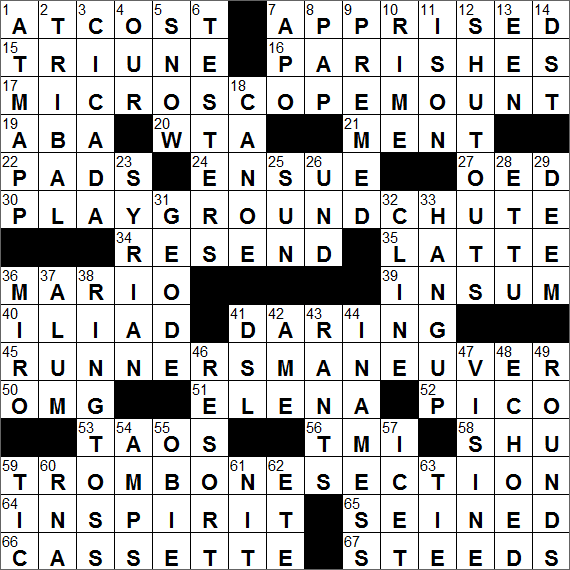 Each of today’s themed answers has the same clue, namely “Slide”. Our verb “to apprise”, meaning “to inform”, comes from the French “apprendre”, which has the same meaning. The past participle of “apprendre” is “appris”. “Triune” is another word for a trinity, three beings in one. The term is often associated with triple deities. The term “Godhead” is used in many traditions, with varying meanings. In the most general sense, the term refers to the essential nature of a god or divinity. The word comes from an Old English word “godhad” meaning “godhood”, the state of being a god. In Christianity, Godhead can refer to the Trinity, the Father, Son and Holy Spirit. Microscope slides are thin pieces of glass on which are mounted samples for examination. Often a “cover slip”, a smaller and thinner sheet of glass, is placed on top of the sample. Originally called “sliders”, such specimens would “slide” into the gap between the stage and the objective lens on a microscope. The American Bar Association (ABA) was founded back in 1878 and is a voluntary association for lawyers and law students. The ABA focuses on setting academic standards for law schools and setting ethical codes for the profession. The organization’s motto is “Defending Liberty, Pursuing Justice”. The former World No. 1 tennis player Billie Jean King founded the Women’s Tennis Association (WTA) and won the first ever WTA Tour Championship. Maria Sharapova is professional tennis player from the town of Nyagan in the Russian Federation. She is a former World No. 1. The first digital version of the Oxford English Dictionary was published on CD-ROM in 1988. There has been an online version available since 2000, and indeed all future editions of the OED will likely only be offered in electronic form. Book 2 of Homer’s epic poem “Iliad” includes the “Catalogue of Ships”, a list of the contingents of the Greek army that sailed to Troy to lay siege to the city. Associate Justice Ruth Bader Ginsburg serves on the US Supreme Court. Justice Ginsburg was the second woman to join the Court, nominated by President Bill Clinton. She was diagnosed with colon cancer in 1999 and underwent surgery, chemotherapy and radiation therapy. During that time she did not miss one day on the bench. In 2009 Justice Ginsburg had surgery for pancreatic cancer, and was back to work 12 days later. Sonia Sotomayor is the first Hispanic justice on the US Supreme Court, and the third female justice. Sotomayor was nominated by President Barack Obama to replace the retiring Justice David Souter. Kit Carson was a frontiersman who moved west from Missouri when he was just 16 years old. Kit Carson’s life was immortalized in the novels of John C. Fremont, an explorer who hired Carson as a guide for his travels through California, Oregon and Nevada. Carson later served with the US Army. He is thought to be the only American to have achieved the rank of general without being able to read or write. Moo shu pork is a traditional dish from northern China, with the main ingredients being shredded pork and scrambled egg. The brass instrument known as a trombone takes its name from the trumpet. The Italian for trumpet is “tromba”, and the suffix “-one” means “big”. So, “trombone” means “big trumpet”. A seine is a type of fishing net. It is long and thin, with floats along one long edge (the top) and weights along the bottom edge so that it hangs down in the water. A seine is usually paid out into the water from a boat, as the vessel moves slowly in a circle driving fish into the center of the net. The French for “box” is “casse”. So, a “cassette” is a “little box”. Jousting can involve the use of a number of different weapons, but when lances are used the competition is called “tilting”. “In Our Time” is the first collection of short stories that Ernest Hemingway had published, in 1925. Hemingway took the title from a phrase found in the English Book of Common Prayer: “Give us peace in our time, O Lord”. Rime is that beautiful coating of ice that forms on surfaces like roofs, trees and grass, when cold water freezes instantly under the right conditions. Walter Johnson was a professional baseball pitcher who played his whole career with the Washington Senators. Even though Johnson retired from playing in 1927, his record-setting 110 career shutouts has never been bested. On the other side of the Atlantic, Daylight Saving Time (DST) is known as “summer time”. The idea behind summer/daylight-savings is to move clocks forward an hour in spring (i.e. “spring forward”) and backwards in the fall (i.e. “fall back”) so that afternoons have more daylight. The boat called a canoe takes its name from the Carib word “kenu” meaning “dugout”. It was Christopher Columbus who brought “kenu” into Spanish as “canoa”, which evolved into our English “canoe”. Since the onset of the Syrian Civil War in 2011, a refugee crisis has developed involving almost 7 million internally displaced persons and almost 5 million displaced persons outside of Syria (as of February 2016). Those are staggering numbers, especially when one compares them to the estimated Syrian population of 17 million in 2014. “Sturm und Drang” translates from the German into “Storm and Stress” or perhaps “Storm and Impulse”. “Sturm und Drang” was the name given to a movement in German literature and music in the latter half of the 18th century. The writer Johann Goethe was a major proponent of the movement, which took its name from a play by Maximilian Klinger. The term “Sturm und Drang” has come to mean “turmoil, upheaval”. It was Shakespeare who popularized the words “Et tu, Brute?” (And you, Brutus? ), in his play “Julius Caesar”, although the phrase had been around long before he penned his drama. It’s not known what Julius Caesar actually said in real life just before he was assassinated on the steps of the Senate in Rome. Amethyst is form of quartz that is purple in color. There was a belief that the stone protected the owner from drunkenness, which is how amethyst got its name. The Ancient Greek “ἀméthystos” means “not intoxicated”. Patsy Cline had a number-one hit in the country charts in 1961 with “I Fall to Pieces”. The song was Cline’s second hit to cross over to the pop charts, after 1957’s “Walkin’ After Midnight”. Joan Miró was a Spanish artist. Miro immersed himself in Surrealism, so much so that Andre Breton, the founder of the movement, said that Miro was “the most Surrealist of us all”. Catalonia is an autonomous community in the very northeast of Spain. The capital of Catalonia is the city of Barcelona. Sandwiched between Catalonia and France to the north, is the lovely Principality of Andorra, nestled in the Pyrenees. “Ame” is the French word for “soul”. Visine is a brand of eye drops made by Johnson & Johnson, advertised to “get the red out”. The red in the eye is reduced because Visine contains tetrahydrozoline hydrochloride, a vasoconstrictor. The blood vessels creating the redness constrict when Visine is applied, and you “get the red out” as the blood is “squeezed” away from the surface of the eye. Roadies working with a musical band on tour have to tote amps from venue to venue. The Obies are the “Off-Broadway Theater Awards”. The Obies are presented annually and the recipients are chosen by “The Village Voice” newspaper. Rapper Ice-T must be sick of having his name come up as an answer in crossword puzzles (I know I am!). Ice-T has been interested in acting for decades and made his film debut in the 1984 movie about breakdancing called “Breakin’”. He has also played Detective Fin Tutuola in the TV show “Law & Order: Special Victims Unit” since the year 2000. Mariska Hargitay is the actress who plays Olivia Benson on the long-running police drama “Law & Order: Special Victims Unit”. Mariska’s father was actor and former Mr. Universe Mickey Hargitay. Her mother was Hollywood star Jayne Mansfield. Richard Belzer started his entertainment career as a stand-up comedian. Today, Belzer is perhaps best-known for playing John Munch on the police drama “Law & Order: Special Victims Unit”, a role that he had to 23 years. Belzer is a first cousin of fellow actor Henry Winkler. RNA and DNA are very similar molecules. One big difference is that RNA is a single-strand structure, whereas DNA is famously a double-helix. Another difference is that RNA contains ribose as a structural unit, and DNA contains deoxyribose i.e. ribose with one less oxygen atom. And that ribose/deoxyribose difference is reflected in the full name of the two molecules: ribonucleic acid (RNA) and deoxyribonucleic acid (DNA). In French, “août” (August) is a month in “l’été” (the summer).